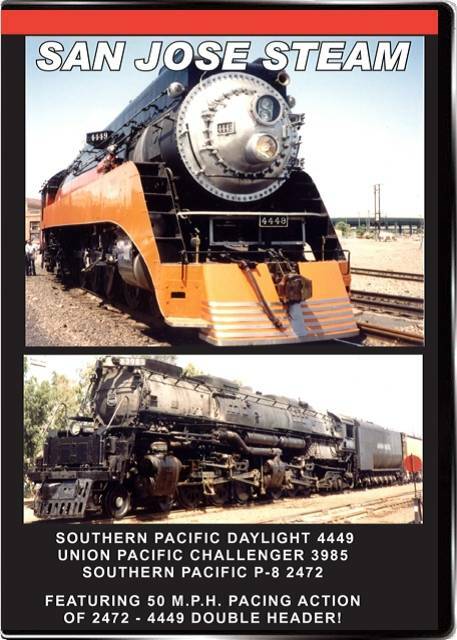 This program features Southern Pacific Daylight locomotive No. 4449, S. P. Pacific-type No. 2472, and Union Pacific 4-6-6-4 "Challenger" locomotive No. 3985 operating in Northern California in 1992 at the convention of the National Railway Historical Society. The Challenger is seen operating in such famous places as James Loop, Altamont Pass and Niles Canyon. 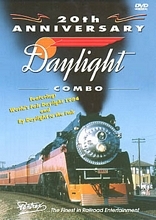 The Daylight is featured in an excursion to Sacramento, and double-heading with Pacific No. 2472. The 2472 is also shown pulling a special train to San Francisco on the Peninsula line. The highlight of the program is sustained high speed double-headed pacing action between San Jose and Watsonville. This program of special steam action can never be repeated, but the sights and sounds of great California steam action live in this program. Running time 58 minutes, plus previews. Steamboy (Revere MA US) on 2016-07-26 20:03:59. Next July, It's Been 25 Years Since One of the most popular cities in California Celebrated the NRHS Convention. Plus A Happy 75th birthday to 4449, And 95th to 2472.